Above: Examples of cardiac magnetic resonance imaging to screen for heart transplant rejection. In the left column, T2 maps show a progression from a control subject on the top to a patient with acute cardiac allograft rejection (ACAR) on the bottom. In the middle, T1 maps demonstrated only subtle increases from a control subject to a patient with ACAR. The right column shows increased extracellular volume fraction in a patient with ACAR. 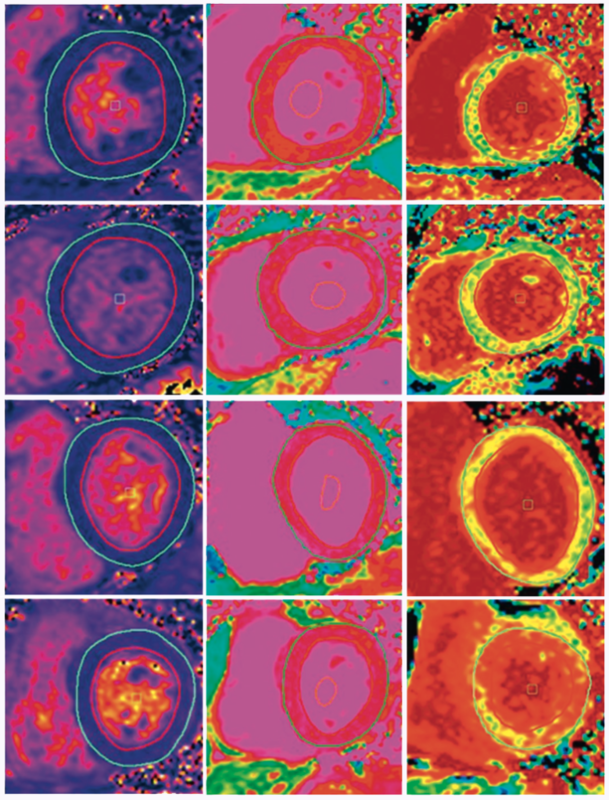 Measures of structural changes derived from cardiac magnetic resonance imaging (CMR) have significant potential as a noninvasive way to measure the risk of heart transplant rejection, according to a new Northwestern Medicine study published in JACC: Cardiovascular Imaging. The use of biopsy – the surgical removal and analysis of small amounts of tissue – is the current gold standard in screening for rejection in heart transplant patients. Heart transplant patients typically have a biopsy performed 10 to 15 times during the first year after transplant alone to track and measure the structural changes that may indicate the development of acute cardiac allograft rejection (ACAR). While observing a transplanted heart for signs of rejection is critical, endomyocardial biopsies are invasive, expensive, carry the risk of surgical complications and are also subject to sampling error, according to the authors. The current study examined the use of cardiac magnetic resonance imaging incorporating multiple features and measures of structural change, as a way to screen heart transplant patients for ACAR, and determine whether it could be used as a noninvasive alternative to biopsies. The study found that a model that incorporated T2 mapping, which measures edema, and extracellular volume fraction, along with the patient’s age, could successfully predict ACAR. The authors noted that additional research is needed in larger patient populations and during acute episodes of ACAR, but that the CMR-based measures have potential as a noninvasive biomarker for heart transplant rejection. The Northwestern authors of the study were: first author Ryan Dolan, MD; Amir Rahsepar, MD; Julie Blaisdell, MS; Kenichiro Suwa, MD; Kambiz Ghafourian, MD, MPH, Jane Wilcox, MD, MS, Sadiya Khan, MD, MS, and Esther Vorovich, MD, all assistant professors of Medicine in the Division of Cardiology; Jonathan Rich, MD, associate professor of Medicine in the Division of Cardiology, Allen Anderson, MD, professor of Medicine in the Division of Cardiology; Clyde Yancy, MD, chief and Magerstadt Professor of Cardiology in the Department of Medicine; Jeremy Collins, MD; James Carr, MD, the chair and Drs. Frederick John Bradd and William Kennedy Memorial Professor of Radiology; and senior author Michael Markl, PhD, the Lester B. and Frances T. Knight Professor of Cardiac Imaging in the Department of Radiology.